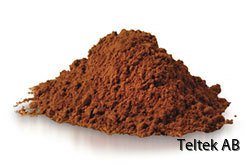 A Teltek customer packs cacao in 200 gram packs. They sample the package weight two times per hour by using a bench scale. Based on the result they adjust the fillers manually. The customer buys a Teltek C60 checkweigher and installs it in the production line. can see that their normal average weight is 207 grams. Then the feedback system from checkweigher to filler was activated. The customer choses to set target weight in the checkweigher to 202 grams. The result is an average weight of 202 g, batch after batch, and a reduced give-away by 2,4%. By using a checkweigher to control every pack the customer has also made sure that not one single pack under the allowed weight tolerance is leaving the production line. The world market price for cacao beans is 2.77 EUR/kg in March 2016. By reducing the give-away with 5 grams per package they save 1 250 kg cacao per day and 28 800 kg per year. They will save 79 776 EUR per year, and the checkweigher investment will be paid in less than 4 months.